2Service B.V. is a relatively new organisation that was established in 2011. We are Samsung's official partner for the distribution of parts in Europe. This means that we are authorised by Samsung for the purchase and sale of Samsung parts for the product groups white goods, brown goods, IT and mobile. We manage two web shops: www.samsungparts.eu and www.mobileparts.shop (previously www.partservicemobile.eu). It is our mission to be a one stop shop for the mobile repair professional via our web shop. On our web shop we offer our B2B mobile repair customers all they need in their daily operations, such as: parts for the repair of smartphones and tablets of different brands (Samsung, Sony, LG, HTC, Huawei and Microsoft) and tools to carry out these repairs. We also offer a range of related products and services, such as accessories for smartphones and tablets and a buy back service for the recycling of parts. Does 2Service also carry out repairs? 2Service is a supplier of parts to repair companies and has opted not to carry out repairs itself, as the company does not wish to be a competitor to its customers. The OEM New quality for iPhone 7 Plus and iPhone 8 Plus will soon no longer be available or sold. Until then, we will sell the remainder of the OEM New stock in our webshop with a specific code in the description that shows from which brand the LCD comes. OEM New LCDs are supplied by LG, Sharp and Toshiba, and the brand of LCD must match that of the backlight. If the LCD and the backlight do not match, the screen's touch function will cease to work approximately two days after repair. 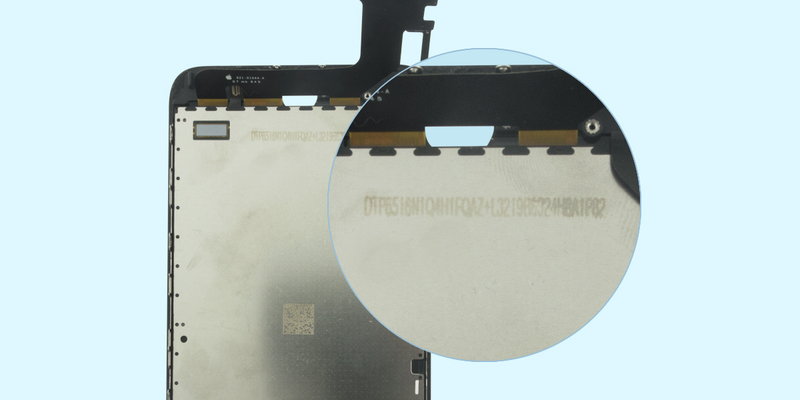 The code of the LCD can be found on the back of the backlight (see below). We will keep you informed as to when OEM New will be permanently replaced by OEM Refurbished. Why does a specific part have different part numbers? This is probably because the part was manufactured in a different factory, which, for that matter, makes no difference in functionality. Which tape/adhesive do I need for my Samsung LCD? Samsung generally applies that a tape / adhesive is supplied on all LCDs. You will find the exceptions below. For these models you need to purchase a separate Tape Service kit. Which screwdriver do I need to repair smartphones, tablets or laptops? 0.8X40 All iPhone models Simtray opener and clean charge connector. 0.8 is the width of the tip in mm, X40 is the length of the shaft: 4 cm. Why can't I order separate adhesive strips for the S7? Unfortunately, these adhesive strips are no longer available separately at Samsung. The strips used to be supplied separately. All the strips for a model are now supplied together in one kit and this can be ordered under part number GH82-12811A. Why can't I order certain Samsung Service Tools (Jigs)? Samsung only supplies Service Tools to authorised repairers. They receive good training on how to use these. Samsung parts come directly from Samsung's European warehouse in Breda. Other brands are taken from various wholesalers and there are no regular suppliers. The original products are purchased from a company that has the best possible connection with the original manufacturer. If we are in any doubt that this is not the case, we do not purchase from this supplier. What are the return rates of the brands and various qualities? All parts in the ranges of the brands Samsung, Sony, Huawei and LG are original. The return rate for these is less than 0.2 percent. Mobileparts.shop has high quality parts for iPhones and iPads in three standards. These are OEM new (Original Equipment Manufacturer), OEM refurb (refurbished, second hand original) and Compatible (high-quality copy). For the first two, the parts are almost entirely original. The return rate for OEM new is less than 1 percent, for OEM refurb less than 2 percent and for Compatible less than 3 percent. Which qualities does Mobileparts.shop supply and what is the difference between the qualities? Everything Mobileparts.shop sells from the Samsung brand is one hundred percent original and new, and comes from Samsung's main warehouse, which for Europe is located in Breda. All parts of popular Samsung smartphone and tablet models are in stock and a delivery period of two days applies for all parts from other models, with the exception of LCDs. Sony, Huawei and LG parts that Mobileparts.shop also has in its range are guaranteed to be original. LCDs, batteries, back covers, buttons and back and front cameras of all popular smartphone and tablet models of these brands are in stock. All smartphone and tablet parts of these four brands have been checked by the factory and have a 3-month guarantee. Mobileparts.shop also supplies only the highest quality for iPhones and iPads. We offer a choice of three different qualities. OEM and Refurbished are of an extremely high quality because they are almost entirely original. OEM new quality is the highest quality. These parts are entirely new and come from a factory that was commissioned by Apple to manufacture them. These parts are checked twice by Mobileparts.shop and have a 12-month guarantee. Customers who are not satisfied with the quality will get their money back. Mobileparts.shop also offers refurbished parts for iPhones and iPads. These are of the same quality as OEM but have a shorter lifespan. Furthermore, unlike OEM, refurbished LCDs do not have Apple's gorilla glass. Apart from this, the same service applies as for OEM. Mobileparts.shop also has compatible parts for iPhones and iPads in its range. These are the best quality copies, which have also been checked twice by Mobileparts.shop and have a 3-month guarantee. Read more about the qualities Mobileparts.shop offers here. Below you will find the General Terms and Conditions that apply to all distance contracts you enter into with us. These terms and conditions do not apply to customers who are consumers / customers not acting in the pursuance of profession or company. Click here for the terms and conditions for consumers. The General Terms and Conditions below contain a lot of information that could be of importance to you as a customer. For this reason, please read the General Terms and Conditions carefully. Moreover, we recommend you save or print the General Terms and Conditions and store them so that you can consult them in the future. 1.1 2Service: 2Service B.V., situated in Arnhem. Registered with the Chamber of Commerce Arnhem under number 66471249, acting under the name 2Service. 1.2 Customer: A legal entity / natural person acting in pursuance of a profession or company which enters into an Agreement with 2Service. 1.3 Agreement: Every Agreement between 2Service and the Customer to which these General Terms and Conditions have been declared applicable. 1.5 Website(s): 2Service B.V.'s Websites to be consulted via http://www.mobileparts.shop and all other related subdomains. 1.6 Account: The Customer's own environment, which is made available to the Customer following registration via the Website. 2.1 The General Terms and Conditions apply to all 2Service's special offers, Agreements and deliveries, unless expressly agreed otherwise in writing. 2.2 In case the Customer in his order, confirmation or notice of acceptance includes provisions or conditions that deviate from or are not included in the General Terms and Conditions, these will only be binding for 2Service if and insofar as they have expressly been accepted in writing by 2Service. 2.3 The Agreement is in Dutch. 2.4 The General Terms and Conditions do not apply to agreements made between 2Service B.V. and customers who do not act in pursuance of a profession or company. The General Terms and Conditions for consumers apply to these customers (consumers). 3.1 The Agreement is concluded on the Website(s) as soon as the Customer accepts the offer made by 2Service, the conditions attached to this by 2Service have been met and the order procedure has been completed. 3.2 If the Customer has accepted the offer electronically, 2Service shall immediately confirm receipt of the acceptance of the offer electronically. As long as receipt of this acceptance has not been confirmed, the Customer has the possibility to dissolve the Agreement. The confirmation also includes the contents of the Agreement, as stored by 2Service. 3.3 It is also possible for the Customer to enter into an Agreement in a way other than via the Website(s). Should an order be made by phone, acceptancewill be confirmed immediately. If this is not the case, no Agreement exists. Should the order be placed by fax, 2Service will confirm receipt by fax. 3.4 These General Terms and Conditions apply to all other types of orders placed via the Website(s). 3.5 Should it appear upon acceptance of the Agreement or any other way of entering into the Agreement that the Customer has supplied incorrect information, 2Service retains the right to meet its obligations only after it has received the correct information. 4.1 All prices mentioned on the Website and in other materials from 2Service are including VAT and other levies imposed by the government. All prices mentioned are excluding shipment costs and possible costs charged for a method of payment chosen. 4.2 The provision in 4.1 concerning VAT and other levies imposed by the government does not apply if the Customer is logged in as referred to in Article 1.2. The prices then shown are excluding VAT. 4.3 The shipment costs are included in the final total price which is shown during the Website's ordering procedure. 4.4 The information about possible shipment costs and other additional costs is provided by 2Service in a location on the Website(s) that can be easily found by the Customer and that the Customer can consult before making the decision to enter into an Agreement. 4.5 Great care has been taken in compiling the contents of the Website(s). However, 2Service cannot guarantee that all information on the Website(s) is correct and complete at all times. All prices and other information on the Website(s) and in other materials from 2Service are therefore subject to programming and typing errors. 4.6 2Service cannot be held responsible for (colour) deviations as a result of screen quality and/or screen settings. 5.1 2Service is entitled to involve third parties in the fulfilment of the obligations arising from the Agreement. These third parties include, but are not restricted to, post and package delivery services. 5.2 On the Website(s) it will clearly be stated in which way the delivery will take place. 5.3 The delivery periods for orders will be clearly described on the Website(s) or if no delivery period has been agreed on, products will in any case be delivered within 30 days. Should a longer period be agreed, this will be adopted as the guiding period. 5.4 The information concerning an existing delivery period and the method of delivery will be provided by 2Service in a location on the Website(s) that can be easily found by the Customer and that the Customer can consult before making the decision to enter into an Agreement. 5.5 Should 2Service not be able to deliver the products within the period agreed, it will inform the Customer of this. In this case, the Customer can agree to a new delivery date or dissolve the Agreement free of charge. In this case there is no right to compensation for damage incurred by the Customer due to any delay. 5.6 Should the products ordered no longer be available, 2Service is entitled to send a similar product to the Customer. 2Service guarantees that the specifications of the alternative delivery comply with what was originally ordered. Should the price of the alternative product be higher, the difference shall be for the account of 2Service. 5.7 As soon as the products to be delivered have been delivered to the address stated, the risk regarding these products passes to the Customer. 6.1 In case of ordering via the Website(s), the Customer should make payments to 2Service according to the methods of payment indicated in the order procedure on the Website(s). 2Service decides which method(s) of payment is/are available for each order. General information concerning methods of payment is also stated in a locatoin on the Website(s) that can be easily found and that the Customer can consult before making the decision to enter into an Agreement. 6.2 Should the Agreement have been reached in any way other than via the Website(s), 2Service shall inform the Customer of the method of payment. 6.3 The various methods of payment for orders placed via the Website(s), or orders that have been placed in another way, may change from time to time. 6.4 2Service is entitled to offer other methods or refrain from offering certain methods of payment. 2Service is also entitled to set further conditions for methods of payment, should 2Service deem this necessary. 6.5 In the event of late payment the Customer is, in addition to the amount owed and the interest on this, obliged to pay in full any extrajudicial and judicial collection costs, including the costs of lawyers, bailiffs and collection agencies. 2Service is also entitled, if after several reminders the amounts have not yet been received, to demand any compensation and overdue payments, as well as to refrain from delivering the orders, if advance payment has been made by the Customer. 6.6 In the case of goods that have been ordered or reserved especially for the Customer, a deposit of 25% of the purchase price must be paid. 6.7 In a situation as referred to in article 6.6 occurs, the Customer should pay the full (remaining) purchase amount before the products shall be delivered. 7.1 We reserve the right to retention of title of all goods delivered by us until the moment of payment in full of the price of all goods delivered to or to be delivered to the Customer. 8.1 Customers as referred to in these General Terms and Conditions do not retain the Right of Withdrawal as referred to in Book 7 of the Netherlands Civil Code. 8.2 Without prejudice to the provision in the first paragraph of this article, Customers have the right to return the order to 2Service within the period after receipt of the order by or on behalf of the Customer as specified in the RMA procedure. 8.3 2Service shall only accept returns that have been registered beforehand via the return form published on the Website(s). 8.4 2Service sjhall only accept undamaged and unused articles in the original, undamaged and unopened packaging. 9.1. 2Service can grant the Customer access to an Account. To that end, the Customer is given a username and a password. 9.2 Via the Account, the Customer can gain access to their own environment, in which for instance, previous orders can be consulted. 9.3 The Customer is not permitted to provide or transfer the username and password to third parties. 2Service is not responsible for misuse and may assume that a Customer who signs in using an Account at 2Service is actually the Customer. The Customer should inform 2Service if they suspect the password has come into the hands of unauthorised persons. 2Service is entitled to take effective measures in such cases. 9.4 Should 2Service realise that the login details of the Customer are known to unauthorised third parties, they will inform the Customer accordingly and take appropriate measures. 9.5 The Customer shall keep the contact information on their Account up to date and guarantees their correctness. The Customer shall immediately inform 2Service electronically of any changes in other (personal) details that are of importance for the execution of the Agreement. 9.6 The version of the relevant communication received or stored by 2Service is proof of this, unless evidence to the contrary is provided by the Customer. 10.1 2Service's total liability to the Customer by reason of attributable failure in fulfilling the Agreement is restricted to the reimbursement of the maximum amount of the price stipulated for that Agreement (excluding VAT). However, under no circumstances shall the total compensation for direct damage exceed 500 Euros. 10.2 - 2Service's liability to the Customer for indirect damage, including in any case - but not limited to - consequential damage, loss of profit, loss of savings, loss of information and damage due to business stagnation, is excluded. 10.3 Besides the cases referred to in paragraph 1 of this article, 2Service has no liability to the Customer for damage compensation, regardless of what an action for compensation could be based on. However, the restrictions mentioned in article 10.1 and 10.2 shall not apply if and insofar as damage is a result of gross negligence or intention on the part of 2Service. 10.4 2Service's liability to the Customer by reason of attributable failure in fulfilling an agreement shall only arise if the Customer immediately and properly provides a written notice of default to 2Service, with a reasonable time period for remedying the failure being given, and 2Service still fails to perform its obligations after that period. The notice of default must contain as detailed description of the failure as possible, so that 2Service may respond adequately. 10.5 Any right to compensation is conditional upon the Customer notifying 2Service of the damage in writing as soon as possible, but at least within 30 days, after occurrence. 10.6 In the event of force majeure, 2Service is not obliged to compensate any damage arising at the Customer's site as a result of this. 11.1 The Customer shall indemnify 2Service against any claims made by third parties, for any reason whatsoever, concerning damages, costs or interest, in connection with an Agreement entered into and/or Services offered by 2Service itself and/or third parties, including trademark holders of the products offered. 11.2 The previous paragraph of this article shall not apply if and in so far as the relevant damage is caused by intent or deliberate recklessness on the part of 2Service. 11.3 The Customer understands that it is not permitted to carry out any form of assembly to products bought from 2 Service. The Customer shall indemnify 2Service against any claims made by third parties, for any reason whatsoever, concerning damages, costs or interest, in connection with this prohibition. 12.1 Customers as referred to in these General Terms and Conditions shall not be entitled to the rights as referred to in Part 1, Book 7 of the Netherlands Civil Code. 12.2 Without prejudice to the provisions of the previous paragraph, as of the day of receipt of the order, the Customer has 30 days warranty on all products supplied. 12.3 Should the Customer wish to make use of this regulation, they shall immediately inform 2Service by means of the RMA procedure as published on the Website(s). 13.1 Despite efforts to provide the Customer with the best possible service, it is possible that the Customer may have a complaint about the service and/or 2Services's products. The Customer may submit a complaint to 2Service by email via the contact information below. The Customer shall receive a response to the complaint within 3 business days at the latest. This may be a definite response but also a message that your complaint needs further investigation. In the latter case, an indication will be given as to when, at the latest, the Customer can expect a definite response. 14.1 The Agreement is governed by Dutch law. 14.2 Changes in management or legal form shall not have any affect on the Agreement. 14.3 Unless otherwise stipulated by the rules of mandatory law, all disputes arising from this Agreement will be brought before the Dutch competent court in Arnhem. 14.4 Partial nullity: Should any provision in the Agreement and/or the General Terms and Conditions prove to be invalid, this shall not in any way affect the validity of the Agreement/General Terms and Conditions as a whole. Parties shall in that case lay down (a) new provision(s) by way of replacement, which as far as is possible by law gives shape to the intent of the original Agreement and/or General Terms and Conditions. Consumers cannot buy on credit. They should pay through iDeal, Visa/Mastercard, American Express, AfterPay or PayPal. Dealers/retailers may buy on credit if 2Serivce has given them permission thereto. Are you a dealer/retailer and do you wish to buy on credit? You may apply for this facility on the SupportDesk page. Mobileparts.shop is a full-range supplier for smartphone and tablet repair companies. We are, as one of the few in Europe, an authorised Samsung distributor and also offer parts for other leading brands/models, such as: Huawei, LG, Sony, Microsoft and iPhone/iPad. In addition to this, we also offer an assortment of the highest quality accessories and tools. - click here to view shipping costs for your country. Within 1 working day of sending the form, you will receive your login details and other information needed to place orders via Partservicemobile.eu. Click on the link SupportDesk to request a dealer login. You can only order parts if you have an account. Click here to request a dealer login now. This will be sent to you within 24 hours. You will benefit from our favourable dealer prices and also have the possibility to order on account. Step 1: Select the type of product and an article you wish to order. Step 2: Click on 'add to shopping basket'. Continue shopping if you wish to buy anything else. Step 3: Click on the link '... items in your basket' any time to see what you have selected and to change quantities or remove parts. Step 4: If you are ready to complete your order, click on 'Order'. Step 5: If you were not already logged in as a user, you can do this now by entering your account details and logging in. Step 6: You have now come to 'Complete order'. Select a method of payment and click on 'Pay'. Fill in your bank or credit card details and complete the order. Step 7: You will immediately receive confirmation of your order via email. Step 8: We will prepare your order for shipment and you will receive an email as soon as your article leaves our warehouse, with a track & trace number of the transporter with which you can check where your package is at any given time. What is the quality supplied? Click here for an overview of all the qualities Mobileparts.shop offers. Which countries are being served? Do you have a comment or a question? Let us know via the contact form under the heading 'SupportDesk'. You are welcome to ask a question via the Chat tool any time. This can be found in the bottom right hand corner of each page. You can contact the SupportDesk staff by phone. They can only answer questions relating to sales. The Dealer SupportDesk is available on business days between 9:00 am and 5:00 pm via: + 31 (0)88 - 2340 392. If you have any general questions, you can send us an email via: supportdesk@2service.nl. Would you like a specific quote for parts? Please email your question to sales@2service.nl and you will receive a pro forma quote. Did you receive a wrong product? Then you can always return it at your own expense without having to fill in the sticker on the box of the LCD. Afterwards we will credit the shipping costs for you. Per shipment you can return one or more products in the same box. It is important to stick a return sticker on the box at all times. The return sticker can no longer be found on the box as usual, but is now delivered separately together with an order of more than 10 LCDs. Lost your sticker or need a new sticker? Use part number RETURN-STICKER to order five stickers in the web shop easily and quickly for the amount of €0,01. Tip: order the return sticker together with your main order to benefit more! Did you receive a defective part? Fill in the customer number, the defect and the order or invoice number clearly on the return sticker. Without these details we cannot handle your request for return (see image 1). When the order or invoice number is not mentioned on the return sticker, we will remit the most recently paid price instead of the actual price paid. The most recently paid price may turn out lower than the actual price paid. Also we will credit your shipping costs after we have received the goods. Does it concern a small part? Please return it in an LCD box and fill in the return sticker (see image 2). You can return your defective or unwanted parts to us at your own expense. Once we have received the goods in the right condition, we will reimburse your invoice and the shipping costs within 10 business days (only applies to repair companies). Ship the return at your own expense; we will reimburse you for the shipping costs afterwards. Warranty in case DOA component part shows signs of use? What does this mean? DOA component part must be brand-new and show no signs of installation / use. Signs of use are understood to mean: any visible damage (scratches, dents, etc.) on the surface of the LCD, which indicates damage during repair / installation or commissioning of the component part by the end user. Original packaging means the packaging in which the component part was initially delivered. Description of complaint required for each component part? A complaint description must be stated during the registration of the return. Refund in the event of unjustified reporting DOA? For component parts that have been wrongly claimed to be DOA, 2Service reserves the right to return these component parts to the customer without refund. A refund can only be issued if an LCD is brand-new and unused and has been provided with a 2Service stamp. However, this is entirely at the discretion of 2Service. 2Service reserves the right to refuse component parts that have been returned if they: 1. are not brand-new and unused, 2. do not bear a 2Service stamp, 3. are of a different quality compared to our available qualities. However, this is entirely at the discretion of 2Service. Click here for the warranty / return policy.